Winter breaks are monopolised by the ski season with over 400 million people taking to the slopes each year. If you don’t like skiing you might find that you avoid travelling in Winter for lack of options; but what if your partner loves to ski? Why not settle on a happy compromise and visit a ski resort that is great for skiers and non-skiers alike? The great thing about our packages is their flexibility, meaning we can tailor the packages to suit your needs; we quite often help to accommodate ski/non-ski couples. These are our recommended resorts that have plenty of appeal for couples/groups that have non-skiers among them. The resort offers a fantastic range of slopes for those who want to head out into the action as it is linked with the Folgarida-Marilleva and Pinzolo ski areas to make up the 'Ski Area Campiglio Dolomiti'. It has 150km of pristine slopes from 850 to 2500m, with a total of 100 pistes (45 blue, 37 red, 18 black), 61 lifts, and 5 snowparks. Whatever your abilities, you’ll find something to challenge you. 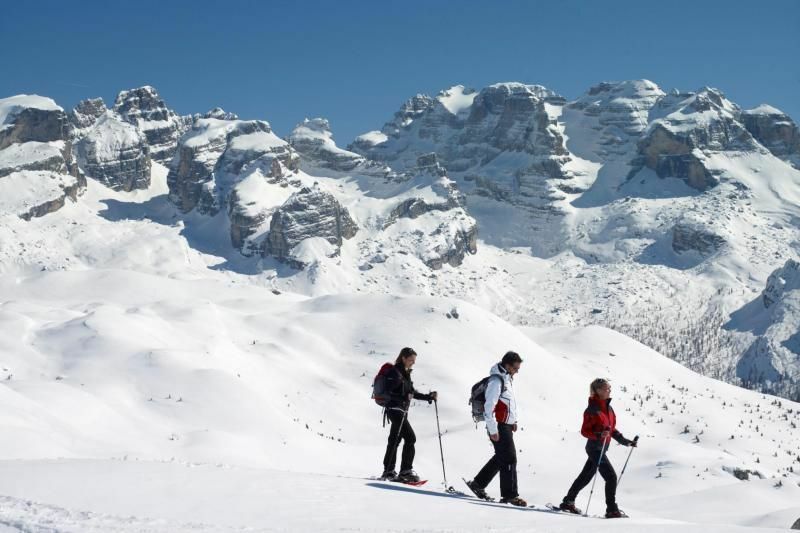 For those who want to stay away from skiing, we also offer a snowshoeing package at Madonna di Campiglio. This means you can join your loved ones while they ski but you get to explore the Alpine scenery as part of a guided snowshoe excursion; it means you’ll see parts of the slopes that the skiers never see! Other activities for non-skiers include open air ice-skating, husky dog sledging and even paragliding! Flachau is part of the Salzburger-Sportwelt ski area, itself part of the larger Amadé ski area, the biggest in Austria. The ski pass here covers a massive 760km of runs over the entire Amadé area. The linked Flachau-Wagrain-Alpendorf area alone covers 120km of predominantly red marked runs from 950m to 2000m. From World Cup runs, to carving slopes, fun slopes, family runs, snowparks and cross country tracks; there is so much choice here that the resort caters to absolutely every type of skier. But it’s not just skiers who will be delighted with Flachau, there are many activities on offer that don’t involve skiing, including tobogganing, snow tubing, sleigh rides, curling and snowshoe excursions. The Amadé spa on the outskirts of Flachau is also worth a visit with waterslides and wave pools for children and swimming pool, saline pools and spa area for adults. If that wasn’t enough choice, the city of Salzburg is only 50minutes from the Flachau ski area, and with regular shuttle buses from the city to the ski resort, there are plenty of opportunities for a day trip. Valmorel links up to the Grand Domaine Ski Area with a total of 168km of pistes with 46 ski lifts over more than 1250m of vertical height drop. The resort is ideal for beginners as there are specially designed, reserved areas that are made safe for learning. There is even a slow chairlift so you can get used to going up, as well as down, in an unintimidating way. Intermediates will have the most fun as the majority of trails are graded Blue or Red. Expert skiers are more likely to head for the red and black runs of the Col du Mottet. Snowboarders are also welcome with a snowzone at the top of the Creve chairlift with a boarder cross and various rails. For those who don’t like to ski? Valmorel is a pedestrianised village and so has the perks of a small town. There is a local cinema, an indoor swimming pool, paragliding and snowshoe excursions. There is also the possibility of ice-climbing if weather permits! Our accommodation in Valmorel offers lovely spa facilities as well, with steam room, whirlpool, sauna, spa jet and massage treatments; meaning you can have a relaxing break with the others take to the slopes! If you like the sound of any of these packages, or even just want a bit more information on any of our destinations, then our customer services team will be happy to help on info@activitybreaks.com!